We all want to be the winners; by extension, we all want to see our kids succeed. And that means not repeating our mistakes. How can we keep that from happening? How do we ensure that their road will be less bumpy than ours was? How in the hell do we insulate them, protect them from the big, bad world? We can’t do that if we want them to grow. According to a Psychology Today article: Mistakes Improve Children’s Learning, one of the worst things a parent can do is cover up a child’s mistake or correct their homework for them so they get a better grade. Even worse is to praise their intelligence. This actually makes them “less likely to persist in the face of challenges.” Kids praised for their intelligence see any mistake as a sign of failure and will give up early on whereas kids praised for their efforts persevere when they make mistakes and will try different approaches to a problem and succeed at much higher rates. Interesting, yes? Still, letting your children fail is no easy thing. Rationally, I understand this concept, but when one of my children is sobbing because she feels stupid after she’s failed spectacularly at something and doesn’t think she can suffer the mortal embarrassment another moment, I forget that encouraging my child to try again, to find her own solution is good for her. Instead, I want to give her the answer. I want to help her avoid the mistakes I made. I have to fight the urge to rescue, to solve the problem for her, to tell her that she’s smart. Similarly, many writers find it difficult to let their characters fail. It feels like a betrayal. We are like their parents, are we not? We create them, we coerce their deepest, darkest secrets out of them – what they want most in the world – and then we deny them that very thing, putting obstacle after obstacle in their path, hurting them again and again until their lives are beyond unbearable. We have to. Otherwise, we’re not writing a good story. There are times that we may be tempted to rescue our characters, to make life a little easier, to solve the problem for them. As with our real children, we’d be doing them a grave disservice. Recently, it came to our attention that all of our efforts at trying to “help” solve our child’s problems were only creating more stress and pressure on our child and not allowing her to find her own solutions. We would have to let go and allow our child the chance to succeed or fail on her own. This had us both very worried. I mean, how far should we let her fall? What if she totally gave up on herself and never recovered? What if we were labeled: The Worst. Parents. EVER? Amazingly, that didn’t happen. When the stress of our constant “helping” was gone and our child was given the responsibility of solving her own problems, she did it. She came up with solutions that we may not have chosen, but they worked. She was able to experience successes – her own successes. And we were there to cheer her on. In all good stories, the character must learn something from their experiences – must grow or change as a result of what they’ve been through. That can only happen if they face their own obstacles; if they live through the gut-wrenching experiences and solve their own problems. No one else can do it for them. For most writers, the hardest part is getting to “The End”. Finishing a first draft can be daunting, but once accomplished, you feel like you can take on the world. You’ve managed to write a beginning, a middle, and an END!!! Congratulations! Have some cake! Then when you wake up the next day, remnants of your celebratory cake still stuck to your face after you crashed out on your couch from the massive sugar rush, you realize that the hard work is just starting; this is where the creative struggle really begins. The revision process can make or break your manuscript and one of the best teachers on how to get the most out of your novel revision is Darcy Pattison. She never told any of us how we should change our stories, instead she gave us strategies and techniques for revision to tell our stories our way, from completing a detailed novel inventory worksheet, which gave us an overview of what was really in our drafts, to exploring the obligatory scene, to character epiphanies and, my personal favorite, the section on sensory detail; how using the senses can really anchor a scene. I still use many of the things I learned from Darcy to this day. Darcy not only teaches other writers how to be better writers, she is a well accomplished writer herself. She has ten children’s books published, as well as several instructive books on writing. 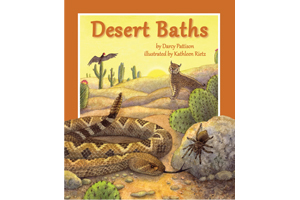 In Darcy’s latest picture book, Desert Baths, she brings her aptitude for teaching together with her creative talent for storytelling. Children curious about animals living in the American Southwest can learn about the diverse species presented through their unusual bath time rituals. From the scaled quail who scrubs herself with ants to the western banded gecko who uses his long tongue to lick his eyeballs clean to the nocturnal mud-bathing activities of the javelina, all twelve animals make do without much water and none use soap. Darcy has paired up again with illustrator Kathleen Rietz, whom she worked with on a previous nature picture book, Prairie Storms. The illustrations are gorgeous and compliment the lilting text that lead you through the desert landscape and leave you wanting to know more. This book can be used as a jumping off point to delve deeper into the world of desert animals. An extensive teaching guide can be found on the publisher’s website. I asked Ms. Pattison if she would be willing to be interviewed for her new book release and she graciously agreed. Valerie Lawson: Darcy, I wanted to say, that reading your book, Desert Baths, brought back a memory of when I was a kid and I asked my mother – when she obviously wasn’t paying attention – if I could go take a bath out in the rain. I was curious about how people bathed before indoor showers. As someone who’s always been curious about the hows and whys of the world, I really enjoyed your book. As a young kid, what was the worst trouble you ever got into? And what was your punishment? Darcy Pattison: I got caught eating pieces of candy from a candy box that was meant for a Mother’s Day present. I had to set up a shop and sell— beg —my siblings to buy pieces of candy at the exorbitant price of 10¢ a piece. I had to use all the money I had saved from my allowance, plus what I could make selling that candy and buy a new box. Talk about humiliation in front of your family—I was totally mortified. VL: How awful! I believe I did something similar when I was in Bluebirds. We were supposed to be selling boxes of chocolates; I had all of these boxes of chocolate in my bedroom. What was a seven year-old to do but open them and start eating? I didn’t stay in Bluebirds very long. I know I was punished for that, but I blocked that part out of my head. VL: Tell me about your most memorable adventure you had with your friends outside of school. DP: I lived in the mountain of New Mexico, just a mile from the Continental Divide. You may think of it as a long continuous line, but it’s really a series of ridges, often skipping a section of the ranges at a time. Ours was a small mountain that was loosely connected into the range. Once, my brothers dared my sister and I to go with them and climb the Divide. You could actually start at one end of “our Divide” and walk up a fairly gentle slope to the top. But this time, the challenge was to climb straight up. Memory is fuzzy—it must have been a couple hundred feet to the top. I remember reaching for the next finger and toe-holds and toiling hard, and working for hours and hours. I made it to within ten feet of the top, but the last bit was truly straight up. I couldn’t do it. It’s something I regret to this day, that I couldn’t finish the last bit of the climb. VL: Isn’t that interesting that some of our most vivid memories are of failures rather than successes? Maybe you’ll make it back there someday and conquer that mountain. On to one of my favorite questions, what was the scariest thing that you ever experienced as a kid? It was the sounds that were the scariest: the barks, the whines, the feet racing around the house, the whimpers. The barks that wouldn’t quit. Finally, my oldest brother had to go out with the shotgun and put them out of their misery. Even that was scary, because he had to avoid getting bit while trying to corner them. It was a sad, scary day. VL: Oh! That’s not only frightening, but so sad. VL: On to something a little more uplifting, what did you want to be when you were in grade school? What influenced this choice? DP: An astronaut, of course. Every kid in the 60s/70s wanted to be an astronaut, it was the time of Neil Armstrong walking on the moon. But then, someone told me that if you wore glasses or had ever had a broken arm, you would never qualify to be an astronaut. I had to give up my dream, since I wore glasses and my right wrist had been broken when I was ten. After that, I couldn’t decide on anything else, so I drifted until I found writing. VL: Ah! How many of us drifted until we found writing? When did you know you wanted to be a writer? DP: I was interested in sixth grade, when I read Lord of the Rings. I wondered what it would be like to be on the other side of reading, to be a writer. But I didn’t do anything about it till I was grown and had three children of my own and started reading the best of children’s literature again. VL: Tolkein is quite an inspiration for a sixth-grader! When did you start pursuing your writing seriously? DP: During nine months of 1985, my husband was unemployed. I was a stay-at-home Mom, who was homeschooling the oldest of our girls. But I had a Masters degree. I did a lot of fill-in work that year, but when a new job came through for my husband, we were still committed to having me stay home with the kids. But I thought that with this Masters degree, surely there was something else I could do while at home, some way to make money to fill in during lean times. I started writing—and never looked back. VL: And we are so very glad that you did. Thank you so much for taking the time to visit with us, today. It has been a pleasure getting to know more about you. 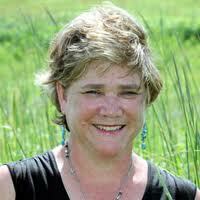 If you would like to learn more about Darcy Pattison, visit her website – Fiction Notes. There you will find an excellent resource of information on novel revision as well as a plethora of other writing topics. And for one lucky reader, I have a signed copy of Desert Baths to give away. To enter to win, leave a comment. You can tweet about this interview or mention it on Facebook for an additional entry. Let me know how you got the word out so I can give you the extra credit – don’t you just love extra credit? 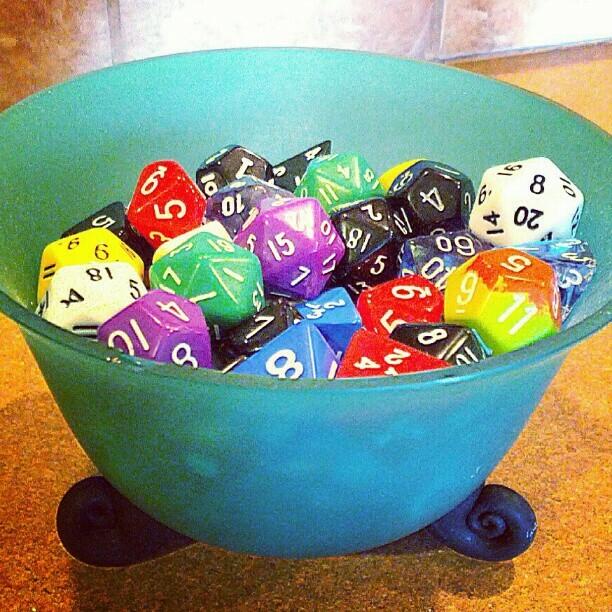 I’ll determine the winner by a lucky roll of the twenty-sided die (or dice, depending on how many entries I receive) one week from this posting. Somehow we came back from the edge of that scary abyss. Gorbachev introduced Glasnot and Perestroika to the Russians. Peace treaties were signed. The stockpiles were reduced and the USSR broke up. The nineties were prosperous and filled with hope. Our fears faded. So did our love of dystopian stories. The fears returned in a much bigger and much scarier way. The monsters of our nightmares didn’t just threaten to hurt us, they actually followed through and did it. And they could do it again. Anytime. Anywhere. We were constantly reminded of this with the daily rainbow of color-coded threat levels – which almost always seemed to stay near the red. Is it any wonder that when the children who grew up in the shadow of 9/11 – fed daily on the politics of fear – reached their teens they found an affinity for stories that helped them deal with all of the feelings that arose from such witnessed atrocities? That’s exactly what dystopian literature allows us to do – explore our deepest fears in a safe place. 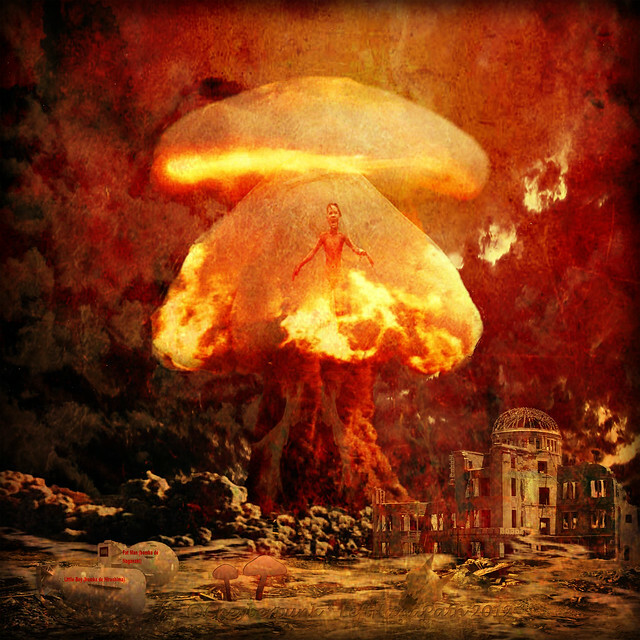 What would happen if my world was destroyed? How would I survive if I lost everything and everyone I ever knew? One reason we love dystopian stories is that we can live vicariously through the characters and imagine what it would be like in a devastated world. We can observe the strong characters in these novels as they struggle through the imagined hells of each dystopian society and see them make it through to the other side. None are unscathed along their journeys, but most grow and thrive. These stories show us that our worst fears are survivable. Today, they are so many fantastic books to chose from. Of course The Hunger Games Trilogy by Suzanne Collins is fantastic but my current favorite is The Divergent Trilogy by Veronica Roth. What great dystopian book have you read lately? What do you get out of reading them? That’s something daydreamers like me dread hearing. Back in school hearing that phrase usually meant that I had been staring into space, thinking about some exciting adventure deep in an underground cavern that had taken me far away from the doldrums of geometry or some other tedious subject that was boring the pants off me. Hearing, “Pay attention!” meant someone else had noticed my mental absence and had decided it was time I started suffering like the rest of the class. Nowadays, it means the same thing – still daydreaming – except now it’s usually my son parroting those words that I’ve said to him a million times, although he’s improved it by adding his own delightful twist. Trevor puts his hands on either side of my face and turns my head so I have to look at him before he says, “Mom, pay attention.” Without this step I may stay firmly planted in my head, ignoring everyone and everything around me for hours. I can’t help it; daydreaming is an essential part of being a writer and one I don’t neglect. But so, I’ve come to learn, is paying attention. Sara Shepard, best-selling author of the Pretty Little Liars series, discussed the importance of paying attention to surprises while writing when talked at the conference about how to write a series. And she is a planner. She said that writing such an intricate series where there are so many secrets, red herrings, etc., requires a great deal of planning ahead and outlining, but she always allows for those moments of intuition that just happen as you write. Karen Cushman, Newbery award winning author of The Midwife’s Apprentice, said something similar during her keynote address at the summer conference about looking for surprises in our first drafts. She said that sometimes accidental repetitions or interesting images we’ve created can lead to surprises we didn’t intend – she once accidentally gave the ocean an address. We as writers are the ones who will be telling future generations what our time – right here, right now – was all about, what will we say? Will we be too easily distracted by all of our media devices and busy lives to slow down enough to observe the world around us, to share what we see? To let other lives impact us? A few weeks ago, when I was parking my car, I saw a little girl trailing behind her mother, dropping bits of candy from a box clutched under her arm. She turned to pick up the one of the bits she’d dropped, but her mother tugged at her hand to keep her moving forward. The little girl stumbled forward in her over-sized rain boots, but her eyes swung back to the dropped candy with a sad sense of longing on her face. That image of the little girl stuck with me all day. I can still see her bouncy curls and loping gait. I don’t know if I’ll ever use that moment in any of my writing, but I’m so glad I stopped to observe that interaction instead of rushing into the store and missing it. There are simple moments like this all around us every day. Instead of taking out your phone the next time you’re waiting in line, look around you and observe your fellow human beings. Pay attention. You’ll be amazed at the surprises you find. I had an entirely different post in mind for today, but circumstances change. We’ve suffered a loss in our little corner of the world. 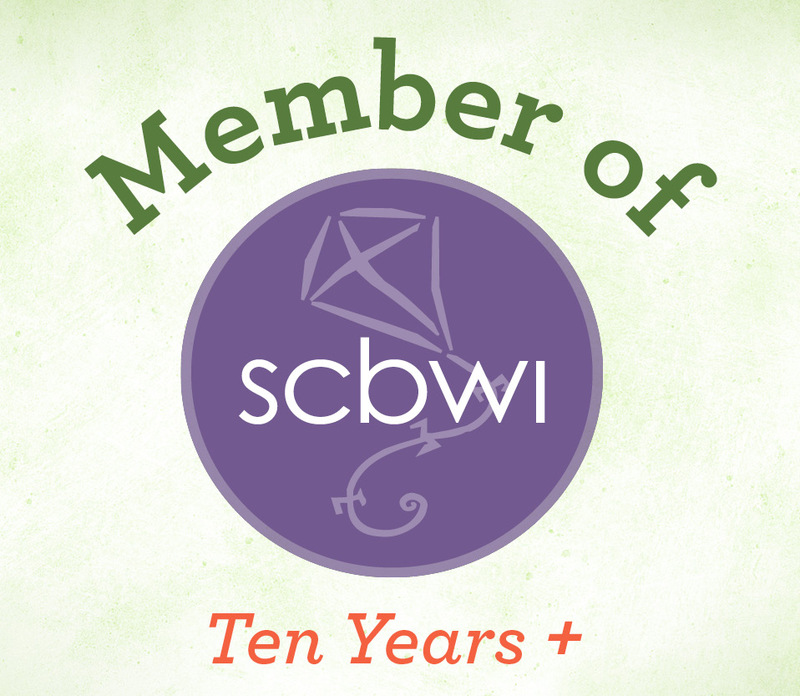 Our Oklahoma SCBWI group lost its oldest and most enthusiastic member this past weekend. Nita Buckley was 97 years old and rarely missed a monthly schmooze or conference and always had a smile and a fascinating story for any who wished to hear. 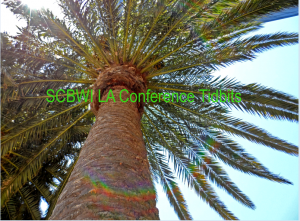 She did miss our last spring conference due to an unexpected hospital visit. She sent her daughter in her stead to take notes for her so she wouldn’t miss out on anything. My daughter sometimes accompanies me to our schmoozes. Nita would always smile at Sophie, turn to me and tell me what a lovely daughter I had. Sophie could rarely tolerate this type of compliment from other adults without wanting crawl away in embarrassment, but somehow she found Nita endearing. They enjoyed many in-depth conversations where Sophie hung on her every word. Sophie was with me when I learned the sad news of Nita’s passing. We cried a bit, hugged each other, and then shared some of our memories of Nita. Sophie told me how delighted she was to learn about Nita’s former career as a professional clown – she even showed the clown ID she always carried portraying her unique clown look to prove it. Sophie was also fascinated by the story of Nikola Tesla that Nita told her. I smiled and remembered when Nita had told me all about her Tesla book many years ago. Sophie then said she was shocked that other inventors, like Thomas Edison, stole some of his ideas because he didn’t file the patent for them. “I don’t know.” Was all I could think to say. Then I wondered if maybe Nita would know. I found myself tearing up several times today thinking about Nita and about how hard she had worked on that book about Tesla – how it would probably never get published. “What a waste!” I thought at one point. Is that the only reason we write? To get published? After all, she did at least reach one child with her knowledge. To me, that does count for something. Besides, that Tesla book wasn’t the only thing Nita accomplished in her years with our group. She continued to learn and grow and try new things. I remember critiquing a rather whimsical picture book she brought to one critique schmooze. I loved it. In the end, I can only hope that I live as long as Nita lived and that I continue to learn and grow and have half the wonderfully infectious spirit that she did. And above all, I hope that I’m still surrounded by my lovely writing friends. We all love you, Nita, and we will miss you terribly.